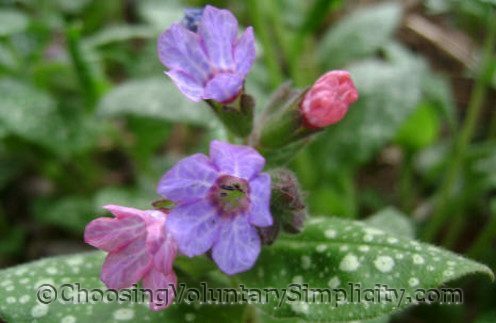 Pulmonaria (Pulmonaria saccharata), also called lungwort, gets its name from pulmo, the Latin word for lung. The name comes from its green spotted leaves, which supposedly look like diseased lungs. There are more than a dozen species of this woodland perennial. Pulmonarias like a somewhat shady location and cooler temperatures. They do best in moist but well-drained soil that is rich with humus, but they can also thrive in ordinary garden soil. They don’t do well in dry soil or hotter climates and in these conditions will need to be watered regularly. If the sun is too hot, the leaves will wilt but will recover when the temperature drops again. Powdery mildew can also be a problem, but it is a cosmetic problem only and does not usually harm the plants. 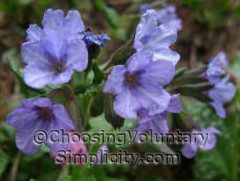 Pulmonarias grow to be more than a foot tall and will form a large clump very quickly. Young plants flower when they are two or three years old. The flowers last until late June or early July… closing on very cloudy days and at night… and look very much like Virginia bluebells, with the same trumpet shape and flared opening. After the flowers fade, the stem droops and lies on the ground. Not all flowers will produce seeds, but if they do, there will be only one black, shiny seed per flower. If you’re collecting seeds, they should be planted immediately, but the seeds need a period of freezing temperatures, and they won’t germinate until the following spring. Pulmonarias hydridize easily, and plants grown from seed will not look exactly like the parent plant. Pulmonarias self-seed with enthusiasm, so if you don’t want more plants, be sure to cut off the flowering stems once the flowers have faded. Larger plants can also be divided in spring, and plants will increase without assistance through their underground creeping rhizomes. Pulmonaria is one of the first plants to produce flowers in spring, sometimes even through the snow. Often flowers will form on stems that are still almost touching the ground. 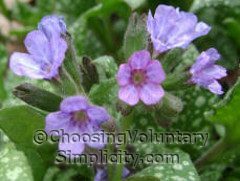 I have often read that the flowers start with pink buds that change into blue flowers, but my pulmonarias keep the color of the bud… pink buds become pink flowers… blue buds become blue flowers. When the first flowers appear, there are almost no leaves on the plant, but leaves will grow within a few days or weeks. The leaves are different lengths and are dark green with prominent white spots. Both the top and bottom of the leaves are covered with hairs that can be bristly or soft. Pulmonaria is a very tough plant… even our nightly spring frosts don’t seem to affect it. A neighbor gave me one small pulmonaria plant a few years ago. I have never divided any of the resulting plants or collected any seeds, and yet we now have hundreds of pulmonarias scattered around our property, even in areas that are a considerable distance from where the original pulmonarias were growing. As beautiful as this plant’s flowers and leaves are, it has now become so invasive that it is crowding out other plants. 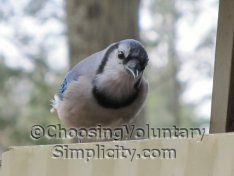 As time permits we have been moving most of them to a secluded area at the other side of our property… a place where, I think, we will appreciate them more! I’ve had trouble growing this one. I have had plants two or three times and they just sort of keep getting smaller and smaller and eventually one spring they’re not there at all. I have no idea what I’m doing wrong and I wish I did because I think it is such a lovely plant. I love the leaves and especially the way they’re pretty all year long. I have to admit that the plant I have doesn’t have the beautiful flowers like yours does. Usually it just has one or two flowers. Hopefully it will have more flowers as it gets older. What I like about this plant is the different colored flowers on the same plant. I have noticed that mine start out as different colors and often change but there are always a few that stay the same colors too. Beautiful photographs and great information for this plant. My experience in the past has been similar to what Leah mentioned in her comment. After a few attempts I think I have a pulmonaria that is going to stick around. It seems that once the plant is established, it will thrive and spread. My problem has been getting it to last long enough to do so. Last year it seemed to turn the corner for the good. This spring I’m still looking for the first blossoms here in my Maine garden. It’s such a nice, old fashiony plant. I hope this one makes it. 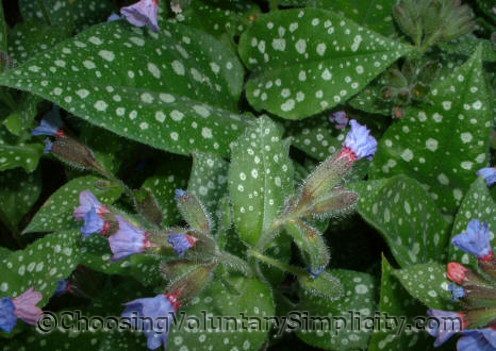 I found your site in an effort to find out why my pulmonaria (which I love) didn’t flower this year. None of the plants flowered although they look healthy and are spreading. Maybe it has a rest phase in it’s life cycle?. Any advice is appreciated. Love your site by the way. Inspiring.